BEST PRICE GUARANTEED! IF YOU FIND LOWER RATES ANYWHER ELSE, WE WILL REFUND IT! 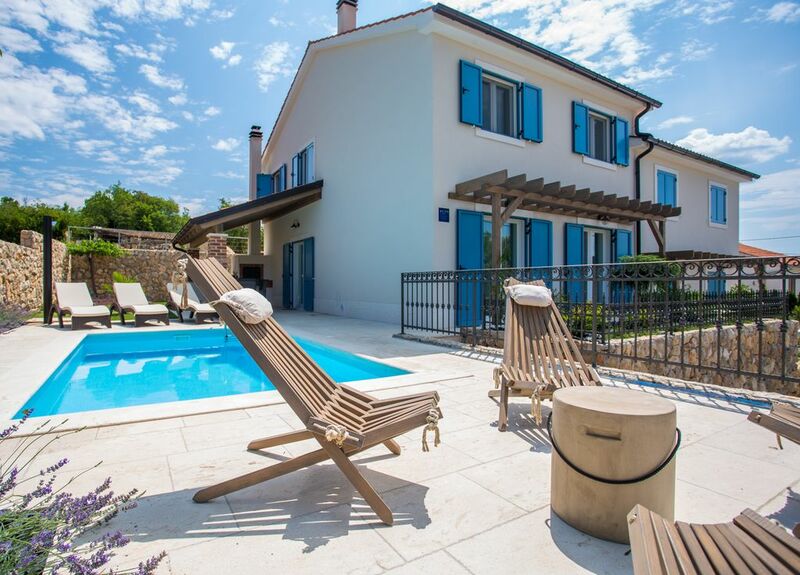 Brand new Villa Tana is the perfect place for a vacation in a small traditional and quiet village of Sužan on the island of Krk. Traditionally mediterranean designed Villa Tana offers comfortable and modern interior. Even though house is a twin house, it guarantees total privacy. Villa Tana is the size of 140 m2 and house plot covers area of 500 m2. The sea is just 1300 meters away, close enough to easily reached it, but still far enough to avoid all the hustle and bustle. The interior of the ground floor of the house consists of a space in which there are an open plan living room, a dining room and a kitchen. The entire ground floor is air-conditioned. In the living room there is a comfortable leather sofa with cosy sofa armchair, a romantic fireplace and 55 inch LED smart television with SAT programs and wireless internet connection. Comfortable sofa can serve as extra bed if needed. In the dining room there is a table for six. Baby stool is available upon request. The kitchen is fully equipped with top end appliances. By the stairway to the first floor is a toilet with a washing machine and all household appliances. Indoor stairway leads to the first floor. Three cosy bedrooms and two bathrooms welcomes you on the first floors. Master bedroom has super king size bed, LED TV, air-condition and a private bathroom. Bathroom offers shower, toilet, hairdryer, sinks and towels. Second master bedroom has super king size bed, LED TV, air-condition and club chairs. Third bedroom has twin beds. Second bathroom offers shower, toilet, hairdryer, sinks and towels. Fine linens and accoutrements provide peaceful nights of sleep. Outside, in the yard, there is a private swimming pool, equipped with RGB lighting for night swimming, sun deck chairs and a garden furnishing for six people. It is surrounded by a beautifully decorated mediterranean garden with a 200 year old olive three. All of that creates a wonderful atmosphere for daily relaxation. Covered outdoor lounging and dining area allow guests full enjoyment of the mediterranean food, that can be grilled in fantastic outdoor kitchen with barbecue. In front of the house are two spacious parking spots. By the parking is a us full storage, where you can find and us very popular SUP, two adults bicycles, wood for barbeque and swimming pool accessories. You can find beautiful hiking tours through landscaped vineyard in the area. 15km from the villa Tana you will find beautiful towns of Malinska, Vrbnik and Krk. Restaurants and bars are available within 2 km. Village center with the local market and a church is only 150 meters. Be sure to try the famous Vrbnička žlahtina and traditionally prepared dishes of this region. Adria Villas is a tourist agency that offers rental service with our selection of luxurious villas and apartments on island Krk in Croatia. Working locally, we share a good relationship with owners of our luxury villas and apartments, and have good knowledge of the area. Each of the properties managed by us is regularly inspected by our management, to ensure that your hard earned vacation lives up to your expectations. We do our best to help in the implementation and organization of your perfect vacation. Our professionalism and experience are warranty for safe and quality holidays. During your stay in any of villas offered by our agency, we are always on your disposal for questions and inquiries. We will be more than happy to fulfill all your needs. Traditionally mediterranean designed Villa Tana offers comfortable and modern interior. Outside, in the yard, there is a private swimming pool, equipped with RGB lighting for night swimming, sun deck chairs and a garden furnishing for six people. It is surrounded by a beautifully decorated mediterranean garden with a 200 year old olive three. Around the villa is beautiful scenery. Guests have one of the many famous Krk wine tasting and try the local cuisine on island Krk. Famous sights, attractions and restaurants leave no one indifferent. Many things that make your vacation in this villa can be special and memorable. toilet, With sink and Washing machine. Rent a boat is upon request. SUP is available for free use. Tolle Gastgeber!Wir wurden mit frischer Pizza empfangen! Die Außenküche und der Pool sind einfach spitze. Die Küche ist gut ausgestattet,für einen Filmabend gibt es einen modernen Fernsehr mit Internetzugang. Die Zimmer sind komfortabel und sauber. The rental price is ALL INCLUSIVE and includes: accommodation, laundry (bed linen, towels), pool maintenance, garden maintenance, water, electricity, tourist tax, registration fee, air conditioning, internet access, final cleaning. A security deposit is not required.